Very few times it happens that you meet someone for the first time and their dynamic personality and affable nature soothes you within a few moments. Such was my experience when I met Jayshree Vyas, managing director of SEWA Bank. Jayshree has been leading the bank since 1986. The organization under her leadership has climbed the ladder of success with a current client base of more than 500,000 women. Education was Jayshree’s priority as a child. Her family was always encouraging and supportive. She was also inspired by her grandparents’ active participation in India’s independence movement. After Jayshree completed her studies as a chartered accountant, which was considered a daunting task at that time, she became a credit officer in the Central Bank of India (CBoI) and foresaw a tremendous growth path in her career. However, she didn’t want to limit herself to one specific department and wanted to broaden her work to make a larger impact on society. Around that time, in the mid-1980s, Ela Bhatt, pioneering founder of Self Employed Women’s Association (SEWA), a trade union for self-employed women, needed a professional to manage the small but growing SEWA Bank. SEWA members had recognized a need to establish their own financial institution to protect them from exploitive moneylenders and offer an alternative to a formal banking sector that was unresponsive to poor women’s needs. 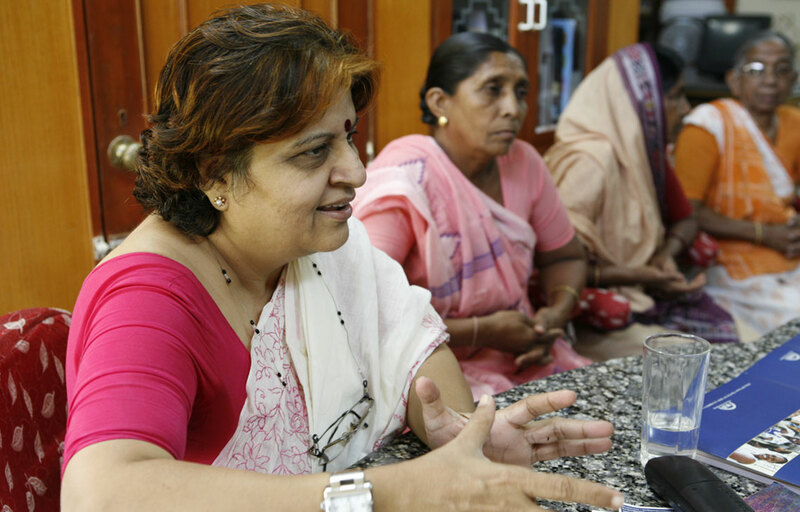 In 1974, 4,000 women members contributed 10 Indian rupees each, and the microfinance institution SEWA Bank was born. When Jayshree expressed interest in joining SEWA Bank, Ela suggested starting on a part- time basis for two years, as the bank was a relatively young organization. But Jayshree felt that this arrangement would not allow her to completely focus on SEWA; so she resigned from CBoI and embraced the opportunity to join SEWA. “The decision was taken based on my intuition that this would work out,” Jayshree recalls. Ela was a mentor and a constant guide to Jayshree. She suggested meeting as many sisters as possible (SEWA customers are known as “sisters”) to gain insights for serving them better. To this day, SEWA Bank has a program wherein all staff spend a stipulated number days in a month staying with poor women to understand their survival strategies. Having developed an understanding about the lives of poor women, Jayshree played a pivotal role in designing financial products to meet women’s needs throughout their lives and help to combat the vicious cycle of poverty. She also introduced a financial literacy program with focus on financial management. When initially introduced SEWA Bank’s services, women are often in debt a trap having borrowed heavily from money lenders at high interest rates. SEWA grants a loan to repay existing debt at a lower interest rate. Other loan products tailored to women’s specific requirements are also offered, such as working capital loans and housing loans. Insurance is available to cover emergencies such as loss of assets, death, health, pregnancy and loss of income during sickness. And deposit services are offered through various saving schemes, serving women’s natural instinct to save. Jayshree believes that savings is as important as credit and can help the poor break the cycle of poverty. Having developed an understanding about the lives of poor women, Jayshree played a pivotal role in designing financial products to meet women’s needs throughout their lives and help to combat the vicious cycle of poverty. Under Jayshree’s leadership, SEWA Bank has always been a learning organization. Thorough research is done prior to introduction of each service and product with the goal of improving women’s lives and increasing their productivity. “A UN study shows that women hold about 1% of total assets all over the world and ownership of assets will give women confidence and help them to become self-reliant,” says Jayshree. In the 1990s, Jayshree and other leading microfinance practitioners began to recognize the need to increase the outreach of microfinance programs, launch new initiatives, and negotiate with policymakers for a more favorable environment. With that in mind, they incorporated the association Sa-Dhan in July 1999. Sa-Dhan is first and the largest network of all types of organizations working in the financial inclusion sector, including various federations, nonprofit nongovernmental organization, trusts, cooperative banks, and development banks. Jayshree serves as the co-chair of the Sa-Dhan. She is also involved in several other initiatives to improve the microfinance sector. She is the managing trustee of the Indian School of Microfinance for Women (ISMW), which was founded in June 2003 as an initiative to address the capacity-building requirements of the microfinance sector. She is also the current chair of the Citi Center for Financial Literacy (CCFL), launched in September 2005 as an important wing of ISMW to disseminate financial literacy programs. At the policy level, Jayshree’s commitment to responsible microfinance that truly benefits poor people has been remarkable. She helped design a code of conduct for microfinance institutions in India that defines “core values” and “fair practices” to ensure that microfinance services through microfinance institutions are provided in an ethical and dignified manner that benefits the clients. She also worked to draft the microfinance bill in India, which was essential in bringing clarity and transparency in the sector and brought microfinance institutions in the regulatory framework. Jayshree also chairs a “Policy Sub-Group” that evolved out of Sa-Dhan’s core vision to create an enabling legal and regulatory environment for the expansion of microfinance services to India’s poor. The bank continues to strengthen its integrated financial services for the poor. It plans to develop a model that meets the tailored needs of each customer and to reach out to every household in region by maximizing the use of technology. Drashti Patel is a management graduate from Xavier Institute of Management, Bhubaneswar originally from Ahmedabad. She joined the Credit Department at Ujjivan as a management associate in April 2013. She recently joined Housing Loans team in Gujarat.